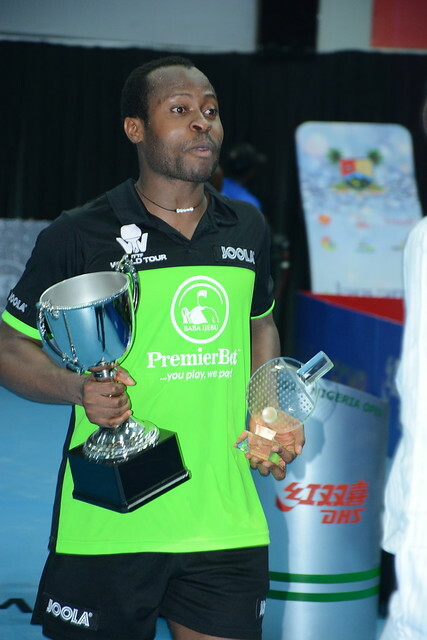 Imposing performances in the two day qualification tournament and on the opening day of play at the 2018 ITTF Challenge Seamaster Nigeria Open in Lagos; on Saturday 11th August, the young ladies from China continued to make their presence felt. Three pairs entered the Women’s Doubles opening round; all three upset the order of merit, all three booked quarter-final places. Notably, they did not do things by half measure; they ended the hopes of the top two partnerships on view. Wang Shu and Wei Wensheng accounted for the combination of Luxembourg’s Sarah de Nutte and Thailand’s Suthasini Sawettabut, the top seeds (12-10, 11-5, 11-8); Qi Fenjie and Sun Chen overcame the partnership formed by Hungary’s Szandra Pergel and Italy’s Debora Vivarelli, the no.2 seeds (12-10, 11-2, 9-11, 13-11). Similarly, not be upstaged, Fan Siqi and Guo Yan ended the hopes of the host nation’s Cecilia Akpan and Offiong Edem (9-11, 11-6, 11-4, 11-6). Farewell to three seeded pairings and there was farewell for one more; in the all Nigerian clash Ajoke Ojomu and Esther Oribamise beat Janet Effiom and Olufunke Oshonaike, the no.6 seeds (9-11, 11-6, 11-7, 11-9). Meanwhile, in the remaining contests it was success for the favourites at the expense of Nigerian opposition. The formation of Norway’s Ilka Doval and Egypt’s Yousra Helmy, the no.3 seeds, received a walk-over when due to face Eva Adom-Amankwaa and Hilda Agbottah; Slovenia’s Alex Galic and Italy’s Giorgia Piccolin, the no.4 seeds, combined to beat Fatimo Bello and Rashidat Ogundele (11-6, 11-2, 12-10). Similarly, Russia’s Irina Ermakova and Olga Kulikova, the no.5 seeds, beat Funmiola Ajala and Halima Hussain (11-9, 11-8, 11-7); India’s Sreeja Akula and Mallika Bhandarkar, the no.8 seeds, ended the hopes of Alimot Ayinla and Agnes Onoja (11-3, 11-3, 11-6). The quarter-finals and semi-finals will be played later in the day.